If your alfresco area is classed as ENCLOSED, you must have an suitable exhaust hood fitted above your BBQ that shifts a minimum of 2000 cubic metres of air per hour. Outdoor Alfresco Kitchens Infresco Range hoods are one of the best Australian made products on the market with its full stainless steel canopy, stainless steel mesh filters, Custom made cowling cover (made to your measurements) & the best option yet is to choose from TOP exit flue pipes or BACK exit to go out through your back wall. 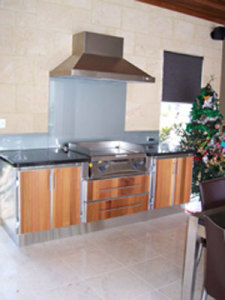 As a manufacturer Outdoor Alfresco Kitchens is one and only company that can design and fabricate the exhaust hoods to your specifications or why not select from the amazing Outdoor Alfresco Kitchens exhaust hoods that are quiet and are made out of the best stainless steel outshinging the typical exhaust hoods. 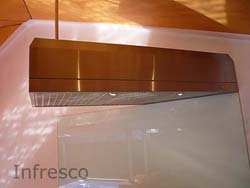 Outdoor Alfresco Kitchens Infresco Exhaust hoods are designed to last a life time, manufactured in Australia with heavy duty 304 Stainless steel and built by the outdoor kitchen experts. Stainless steel microfibre filters for maximum absorption of fats and fumes. 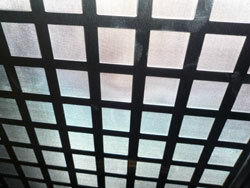 Ultra tough filters can be cleaned in a dishwasher or under a high pressure hose. Two 35 watt halogen lights positioned to front of hood for better light spread. Meets the standards set down by Energy Safety and Alinta Gas. Our attractive filters have been specially designed for maximum absorption of fats and fumes. Our units are 315mm high, excluding flue. Our hoods come with a 400mm stainless steel flue cover as standard- or we can custom make the flue cover to suit your ceiling. 35 watt halogen lights positioned to front of hood for better light spread. 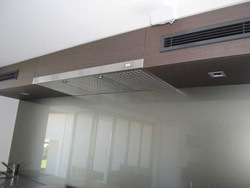 So why would you need a custom made range hood? 1. The 4 standard sizes of 900mm, 1200mm, 1500mm and 1800mm won’t fit in your alfresco space. AS CUSTOM EXHAUST HOODS ARE INDIVIDUALLY DESIGNED, WE ARE UNABLE TO GIVE AN ONLINE PRICE. CONTACT US WITH YOUR SPECIFIC REQUIREMENTS. 1. Do I have to install an exhaust hood above my barbecue? If your alfresco area is classed as enclosed (ie, more than 50% enclosed) then you must install an exhaust hood above your barbecue which complies with Energy Safety laws (see below). 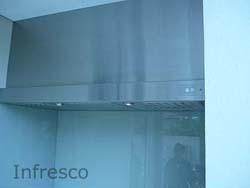 Even if your alfresco is not classed as enclosed, many clients choose to install an exhaust hood to extract fumes and to protect their ceiling. 2. What are the Energy Safety laws that apply to alfresco areas? First of all you must determine if your alfresco area is classed as “enclosed” or “outdoors”. See The Energy Safety Website for more information or click this link. I. Your bbq must have flame failure devices fitted to every burner and be licensed for indoor use (be aware that there are some bbqs on the market that have flame failure devices fitted but they are NOT licensed for indoor use). II. Your bbq must have a commercial grade exhaust hood that moves a minimum of 2000 cubic metres of air per hour. 3. What size exhaust hood do I need to install? 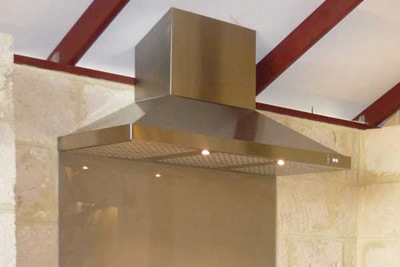 For sufficient ventilation, you need to install an exhaust hood that is as wide or wider than your barbecue. For example, if your barbecue is 900mm, then you require an exhaust that is 900mm wide or greater. If you have a separate wok installed in your cabinets, then you should ensure that your exhaust hood covers the wok area as well as the barbecue. Also, if you have a pizza oven that is not separately flued, then this should be placed under the exhaust hood. 4.What height does my exhaust hood need to be? Energy Safety Regulations specify the height at which an exhaust hood must be installed when over a barbecue. If the barbecue has an open grill, the exhaust hood must be installed at least 1200mm above the height of the open grill due to fat fires. This is so that the flames cannot be sucked up into the exhaust hood. If the barbecue has a full hotplate, then the exhaust hood must be installed at least 900mm above the height of the hotplate. If you do not have sufficient height in your alfresco area, you will need a custom made exhaust hood that satisfies the height requirements. These custom made hoods are slimmer than our standard hoods. 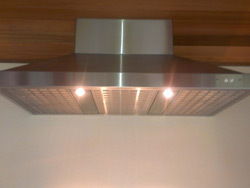 We can also install the exhaust hood in the ceiling cavity to satisfy height requirements. 5. Does my exhaust hood need to be flued through the roof, or can it be flued through a a back wall? If you choose an Outdoor Alfresco Kitchens exhaust hood, you can have your exhaust hood flued through the ceiling or through the back wall. We manufacture our exhaust hoods either as top mounted units or as back exit units, so that we can cater to all alfresco requirements. This exhaust hood has a back exit and is flued through a back wall. In this case, we give you the option to manufacture a flue cover extending to the ceiling, so that it looks like it’s flued through the roof. 6. I have no structure to hang an exhaust hood from. What can I do? 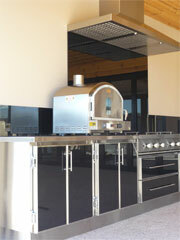 In most cases Outdoor Alfresco Kitchens can design an exhaust hood to cater for your needs. But it’s always best to seek Outdoor Alfresco Kitchens’s advice BEFORE you design your outdoor kitchen. Our expertise can save you thousands.